"Flow" refers not only to the water in the stream, but to the state of mind I hope to achieve when painting. Flow feels good! Although I can't force it to occur, there are certain physical, mental, and spiritual conditions I cultivate to increase its likelihood. Physically, I want to be well-rested, nourished/hydrated, clothed appropriately for the weather, and free from arthritic hand pain. (Tylenol? Check!) Mentally, I think about sunlight and shadow, composition, editing the scene, colors, textures. Spiritual preparations include focus on being fully present; gratitude for the resources and opportunity to paint; confidence in my abilities; being open to outcome. 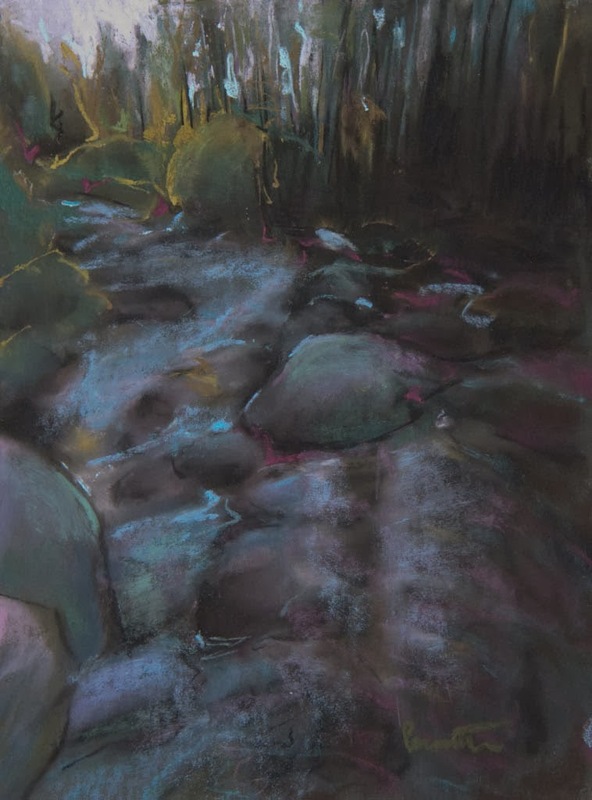 My painting "Flow" comes from a photo taken during last summer's workshop with Bill Cone at the San Francisco State University Sierra Nevada Field Campus. In my mind's eye I see myself setting up my easel on a big boulder in dappled light, shifting around a little bit to get comfortable, listening to the sounds of the water, beginning to work, and then suddenly being aware that Bill was at my elbow saying it was time to pack up and go. Flow? Check! I watched you work on location once, it looked trance like and your result was absolutely true to the day. I remember that day well and enjoyed being with you and the others "together yet apart" as my friend Celeste explains it. I'm sure you and I will have more opportunities to paint together in the coming months.